Speaking about the game, Kolkata Knight Riders’ captain Gautam Gambhir decided to bowl first and put the Kings in to bat on a bowler friendly wicket. Brendon Mcullum scored a brisk 32 off 12 balls. The two destructive Super Kings’ openers Dwayne Smith and Brendon mcullum came out to open the innings for their side. The opposition had to restrict them or else we know how destructive they can be. The Kolkata bowlers did the half job we can say, as they dimissed Dwayne Smith cheaply but failed to restrict Mcullum. Dwayne Smith departed early as ten Doeschate , the Netherland all-rounder took off a blinder to gift Smith a golden duck! Pat Cummins was the bowler who did the job for Kolkata. In came Suresh Raina the CSKian No.3. He started off well, scoring two oundaries but then he perished early yet again, falling to Umesh Yadav. Gautam gambhir gave the ball to Brad Hogg, the 44-year old Australian veteran. This marked the start of a devastating spell of left-arm chinaman bowling. Hogg got rid of the danger man Brendon Mcullum, leaving Chennai in bits and pieces. Faf du plesis was the new man in. But, after scoring 20 he was also sent back to the hut by Hogg who claimed his second wicket of the match with that! It looks like MS Dhoni is not feeling comfortable in this edition of the IPL. He continued his poor form with the bat, as he failed to pick up a googly by the leggie Piyush Chawla. Dwayne Bravo[30(32)] and Jadeja[24(30)] stitched on a good partnership to take CSK to a good total. 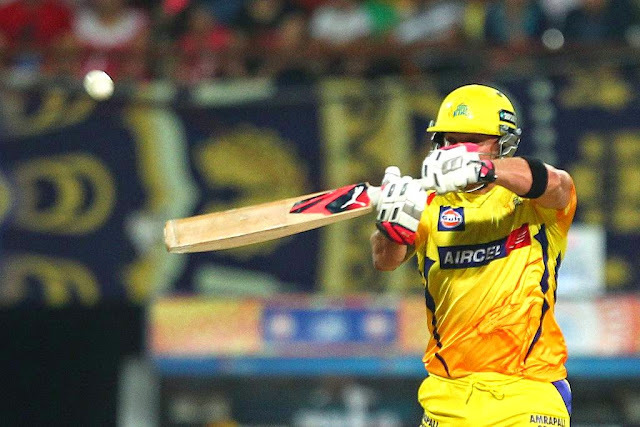 At the end, it was the young Pawan Negi who smashed 27 off just 13 balls to take CSK to 165/9 in 20 overs. Brad Hogg was the star with the ball for the Knights as he registered figures of 4-0-29-4 to become the oldest player in the IPL to take a four-wicket haul. The Kolkata Knight Riders had to play like defending champions to chase this target on a pitch that was helping the bowlers and not the batsmen. Robin Uthappa, who has had a bad season was keen to prove his point came out to bat with skipper Gautam gambhir who has had a decent season. Initially both the openers accelerated but Gambhir fell to Mohit Sharma soon then. On the other end, Uthappa was batting well and keeping one end secure. The middle order disappointed as Manish Pandey[3(10)] and Suryakumar Yadav[2(3)] who was dismissed by debutant Ronit More failed to leave an impression. However, West-Indian all-rounder, Andre Russell came in to bring things in order for the Knights.He blazed his way to 59 off just 32 balls sealing it off for Kolkata. Robin Uthappa batted well to score 80 off 58 deliveries too. Man of the Match: Russell was declared the Man of the Match for his quick fifty and the spell of 2-20. 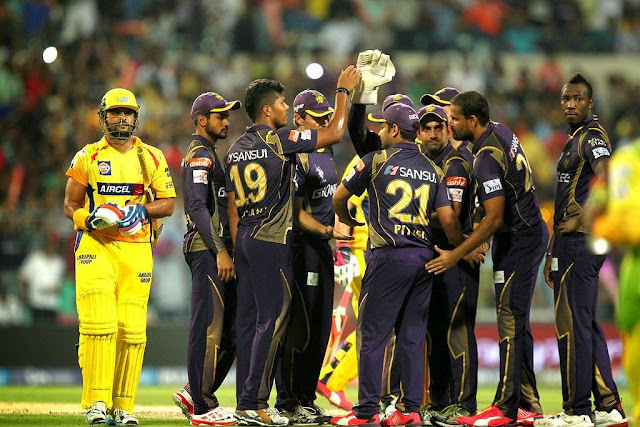 Kolkata Night Riders ease past a lethargic Chennai Super Kings in IPL 8.